You are here:Home Now Stackable! When we introduced our new rack and refill system in 2018, we switched the protective wrapping from shrink-wrap to a thicker plastic flow-wrap for added protection. A great idea, but the flow-wrap made the racks more difficult to stack and store and increased the footprint of the outer box. 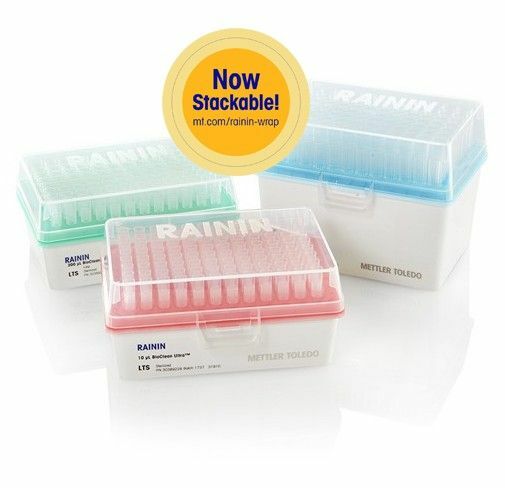 At Rainin we're committed to continually improving in ways that deliver the finest products possible. But flow-wrap was one improvement that wasn't universally loved, so we've switched back to shrink-wrap, which has served us so well for many years. The transition will be quick, but in the interim, your order may include racks packed in both flow-wrap and shrink-wrap. What makes our new rack and refill system so great? Same great tips, just the packaging has changed. TerraRack®, StableRak™ and StableStak™ have not changed.